and the dance bust right there. And the name stuck." Lone Ranger spent the late 1970s and early 1980s tearing up dancehalls all over Jamaica. He was a hit-maker on record and a hot commodity live . With his natural confidence, superb showmanship and finely honed skills on the mic, he set the trend for the coming generation of deejays. Born Anthony Waldron in Jamaica, he moved to the UK as a child. After spending seven years in London with his mother he moved back to Jamaica at the age of 12. During the 1960s, racial relations were tense in the UK and many black youths felt threatened by skinhead violence. So, in 1971, they boarded a Spanish liner at Southampton. After nearly two months they were back in Kingston. Ranger had absorbed a wide variety of musical influences abroad. His mother used to hold parties in the house where they lived with his two brothers and from his room he could hear the music playing late into the night, an eclectic mixture of rocksteady and British pop - from The Beatles to Cilla Black. His mother had also enrolled him in dance classes and music lessons where he learned to play the violin and trumpet. Ranger became even more interested in music when he got back to Jamaica, especially recordings by the popular deejays. "I would get my lunch money and instead of buy lunch, I would walk all the way to downtown Kingston, North Parade, by Randy’s, Joe Gibbs, and I would buy U Roy, Jah Youth. Their style sound so new, so nice. So I’d buy 45s and I go home and, when my mother’s not around, I would play it on the stereo, write off the lyrics into a text book. "During that time, my friend Chester Synmoie and I had a friend, Tony Walcott. They would make sure that every Sunday, we would meet up together - me, Welton Irie and Carlton Livingstone - and they would train us to play a lot of dubwise. We would have to find lyrics to deejay on the rhythm, to ride the rhythm, to structure the rhythm properly, to get the melody of the music, to get the swing. We had to do this every Sunday - and, one day, we were ready to go in to Mr Coxsone Dodd." Chester, Ranger’s lifelong friend and manager, brought him down to Studio One and introduced him to Coxsone Dodd. Dodd asked him what rhythms he wanted and Ranger picked out a few. After all the practice he had had he could handle anything that came his way. He was already a very disciplined, serious, ambitious artist, determined to record and make it to the top. Dodd took Ranger on right away. Chester recalls, "Ranger have a unique style. He’s a little bit different. Maybe because of some of a little English accent inna him and thing when he started. But you can see how him sound different." Ranger adds, "Coxsone liked me right away. He knew big things woulda came out of my style." Despite listening to and being influenced by U Roy and Big Youth, Lone Ranger spoke his words a little more clearly. Whereas U Roy had a slur, Ranger enunciated all the letters of each word, making his long and complex lyrical narratives all the more compelling. Ranger didn’t just jump and jive with the rhythm - he told entertaining stories in complete sentences using clever turns of phrase, such as in the track Barnabas Collins, where the "wicked and dreadful vampire’ will "chew your neck like a Wrigley’s’. Coxsone knew talent when he saw it and he started recording Ranger right after the audition. The relationship lasted the rest of Dodd’s life, even after he had moved his business to New York. "I am the only deejay in Studio One who has recorded three albums for Coxsone. And my hit 45 “Love Bump” is also the last hit tune that Studio One has had in Jamaica, back in 1981- the last number one for Coxsone." First Coxsone released the album, "The Other Side of Dub" - experimental in that it had all the vocal-cuts on one side, and all the classic Studio One dub versions on the other. His second album for Coxsone, "Badder Dan Dem" became a major hit in Europe. The third release was a more recent compilation of Ranger’s "lost years"- his time in the US between 1985 and 1995, called "Top of the Class", made up of a series of impromptu collaborations between Ranger and Dodd. "This album, when Coxsone had an idea, when he wanted to try something, we would go in the studio." In the late 1970s and early 1980s, Ranger was enjoying number one hits and he brought success to each sound he worked with. In 1979, his hit album "Barnabas in Collins Wood", produced by Chester’s brother Leon Synmoie, gained him the award for "top deejay of the year", and "Soul to Soul", the soundsystem he was fronting, won "number one sound" for the year. The same year, Ranger was invited to appear on Reggae Sunsplash, a lone dancehall performer amid a sea of roots artists including Bob Marley, Burning Spear, Jacob Miller and Joe Higgs. The next year, his Studio One 45, "Love Bump", went to number one, and his then current sound, Virgo was crowned champion sound of the year. In 1981, his song for Winston Riley, "Rosemarie", shot to number one, and Virgo was crowned king once again. The "M16" album for Channel One was one of the definitive albums of the 1980s, although it was never released in Jamaica, only aboard. These days, Ranger is working hard to bring back those golden years of rub-a-dub. His Silver Bullet label is active again and Ranger is working with older artists. For the past eight years, he’s been doing a three-month tour of Europe every spring and summer, playing 25 to 30 dates across the continent. "The rub-a-dub thing is on the rise. It’s crazy. They love it. The original style. There are few original deejays around who can give you that style." Luckily, Lone Ranger is one of them, and still going strong. 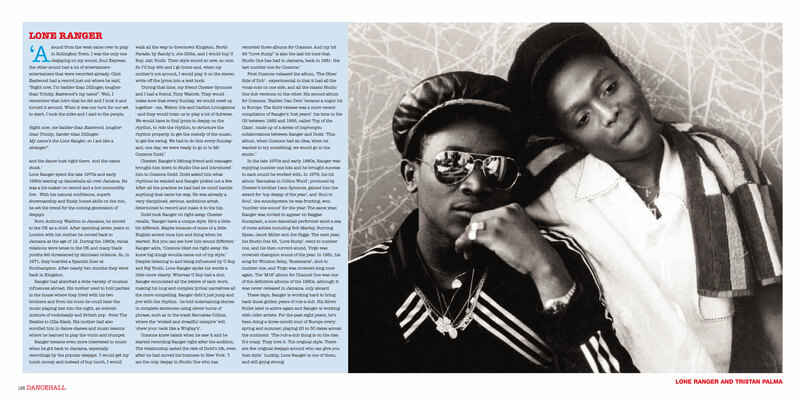 "LONE RANGER" - extract from the "Dancehall" book issued by Soul Jazz Records on page 126. Grant Phabao & The Lone Ranger - Sweet Talking - out july 11th on Colored-Inc.